As demands and pressure on the humanitarian community to respond to major disasters continue to rise, the Emergency Services Branch in Geneva focused its efforts by not only responding to all emergencies in 2015 but expanding and strengthening its wide networks across the sector. Together with its partners, the Branch took on the year with a series of successful trainings and simulations. ESB worked tirelessly this year to ensure that every section, every partner and network were driven by one goal: Prepare the humanitarian community and work with its partners to better respond to any major emergency. 2014 had witnessed multiple major emergencies from the response to the Ebola epidemic, the Gaza crisis, the unfolding a major emergency in Yemen and of course the worsening of the Syrian crisis spilling into Iraq. This year was different. The prolonged conflict in Syria, the crisis in Yemen and of course the devastating earthquake in Nepal dominated the year, but also allowed the Branch to reinforce some key services and networks vital to the overall emergency response. In 2015, the Emergency Services Branch trained an impressive 2,231 response experts covering a wide range of technical areas. The year in the words of ESB staff. Starting with the search and rescue group INSARAG, the network had its biggest event in its rich history in Abu Dhabi, the 2nd INSARAG Global Meeting. The team boosted the number of teams ready to be deployed to any major emergencies and today 80 countries have subscribed to the INSARAG guidelines. In the fall, Chile hosted an INSARAG Regional Exercise, with dozens of participating organisations and governments from within and beyond the region taking part in an earthquake response exercise. With a similar exercise in Mongolia in June, these were the first major simulations using the new INSARAG guidelines. The Chile exercise also added national and international Emergency Medical Teams as active participants to the response equation. 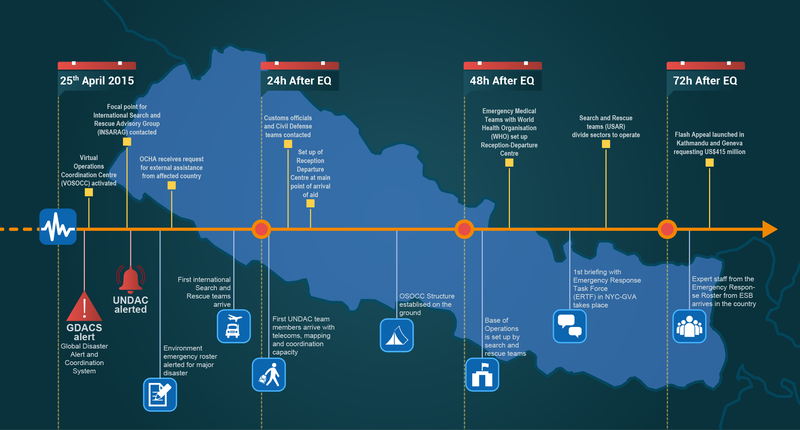 Throughout the year, teams worked hard to prepare its best staff to be deployed and this was seen in its efforts during the Nepal crisis where many lives were saved thanks to the efforts of the 18 classified INSARAG teams from all over the world. One of the main lessons learned this year for the Branch was the importance of regional organisations, like ASEAN and the European Union, and the need to go further in its cooperation with other key regions. ~ Rameshwar Dangal, Ministry of Home Affairs, Government of Nepal in a letter to the USAR NL team on 3 May 2015. The UN Disaster Assessment and Coordination (UNDAC) also had a full year for the Branch with a dozen of coordination missions and three preparedness missions to assess response capacities in Paraguay, Panama and Sao Tome. This year also saw the successful take-off of the Consultative Group for Emergency Preparedness and Response. The Consultative Group is a “network of networks” that brings together a community of Member States, UN agencies, NGOs, academic institutions, and other actors involved in emergency response. They come together once a year to develop solutions to common operational challenges ranging from environmental risks in humanitarian crises to improving information sharing in the 72 hours following large sudden-onset emergencies. The Branch also strengthened the Virtual OSOCC, an online platform that is now widely used by over 22,000 practitioners. The Branch organized simulations exercises where hundreds of new users were taught how best to share information and data in practice during a major emergency. For the Nepal emergency for instance, some 2,900 disaster responders and aid workers exchanged operational information on the platform. Over 100 relief teams from 43 countries registered on the platform to communicate their activities. This was a huge win for the Branch but more importantly for the humanitarian community which is seen as ever more united and coordinated when responding to complex emergencies like the Nepal earthquake. Boosting its reach and diversity, the Branch also worked with the World Customs Organization and other partners to develop a dedicated guide to receiving humanitarian assistance for national customs authorities. ESB facilitated a key meeting in the Dominican Republic where local authorities and OCHA staff successfully agreed on a guideline on how best to receive and process humanitarian assistance the next time a major emergency takes place in the region. ESB was also a central actor in improving its services in the area of civil and military dialogue. A field handbook for humanitarians, that promotes common understanding and approach in engaging military actors in emergencies, was published this year. The Branch also trained close to 300 representatives from the humanitarian and military communities to better understand the importance of civil-military dialogue. Organizations included UN agencies, UN Peace Operations, militaries, national disaster management authorities, Red Cross and Red Crescent Movement, NGOs, donor organizations, regional organizations and others. This crucial work came to life during lengthy negotiations between military officials and United Nations staff deployed for the Yemen crisis to ensure the safe delivery of aid supplies across the country. The successful talks helped UN agencies and many of its partners to safely deliver over 400 convoys of lifesaving aid in 2015. Overall, the Branch improved OCHA’s ability to deploy its staff at important moments during emergencies with an impressive 343 staff trained and 156 experts deployed between January and November. The three major emergencies this year were the response to the Ebola outbreak, the Nepal earthquake as well as for the Yemen emergency. In another sector of activities for ESB in 2015, over 240 experts were trained on environmental emergency preparedness. Now more than ever before, OCHA and its networks are better prepared to respond to complex environment crises as well as get the humanitarian system, regions and countries ready to respond to any major disaster. For instance, the team in Geneva coordinated three environment responses in 2015, the latest being in November in Paraguay with a team of experts being deployed to analyse the impact of a serious accident in San Lorenzo. As 2015 is coming to an end, the Branch is already looking forward to next year with the same energy and focus. To kick-start the next year, under the auspices of the Consultative Group, ESB will lead the Humanitarian Networks and Partnership Week in early February. The event will be a crucial time for all humanitarian actors working closely with OCHA and other UN agencies to deepen its knowledge of how best to prepare and also respond to the many challenges the system face every single year. Onwards! Expanding international networks to enhance preparedness and response to environmental emergencies is critical. Particularly when lower levels of government are not as integrated with their ability to respond to multiple types of disaster.